How: Send all contact information to sacfitnessfairy@gmail.com. 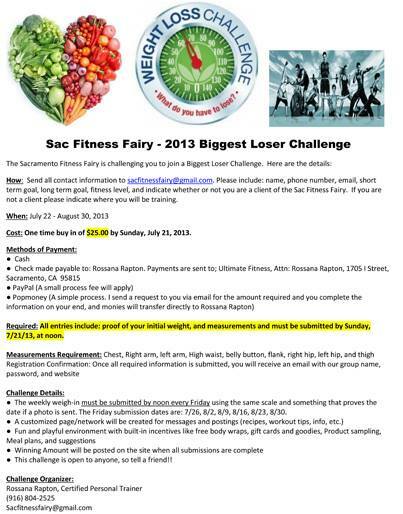 Please include: name, phone number, email, short term goal, long term goal, fitness level, and indicate whether or not you are a client of the Sac Fitness Fairy. If you are not a client please indicate where you will be training. Cost: One time buy in of $25.00 by Sunday, July 21, 2013. 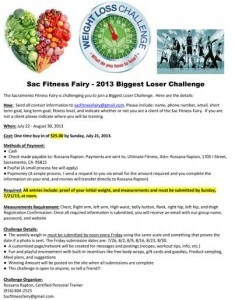 This entry was posted in Guest Blog: The Sac Fitness Fairy and tagged Fitness, Sac Fitness Fairy, Sacramento, Ultimate Fitness, workout by TheFatPanther. Bookmark the permalink.